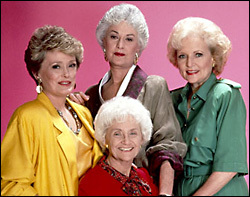 The "GOLDEN GIRLS" house was supposed to be located at 6151 Richmond St., in Miami, Florida. In real life, the original home was located at 245 N. Saltair Ave, in West Los Angeles. Later, the Disney company built a copy of the house at their Disney Studios in Orlando's Disney World, and it became part of the studio tour there, until it (the replica) was torn down in 2003. But the original home still stands in the hills of Brentwood (although a wall & high foliage makes it difficult to see much of the home when you drive by). In the 1982 music video "THRILLER," Michael Jackson is chased by ghouls through a neighborhood of old Victorian homes. That neighborhood is Carroll Avenue (east of downtown L.A., the same street where you'll find the "Charmed" house), and the main house in that video can be found at 1345 Carroll Avenue. The outdoor scenes at the Carrington mansion from the 80's TV series "DYNASTY" were shot at a Pasadena home, located at 1145 Arden Road. The Colby mansion from "THE COLBYS" is at 1060 Brooklawn Drive, in Bel-Air.